Posture is the position of the body while a person is sitting, standing or lying down. Good posture, also referred to as neutral spine, has many health benefits including maintaining correct bone and joint alignment, reducing stress on ligaments, preventing muscle strain, conserving energy in muscles, and decreasing abnormal joint wear. Staying aware of bad posture and sitting up straight works well, until you stop thinking about it. That’s where a chiropractor can help! A chiropractor can help improve a person’s posture by assessing and determining the underlying cause of the poor stance and correcting it. This helps the patient sit and stand up straight without having to consistently remind themselves to do so. 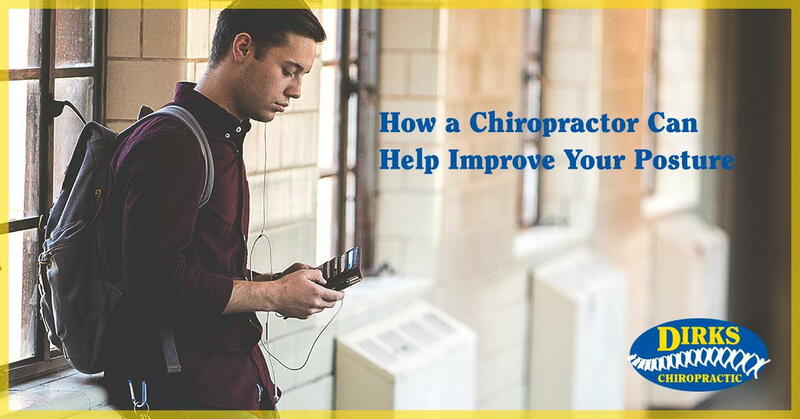 When the chiropractors at Dirks Chiropractic are assessing what’s at the root of your posture problem, they often look for variance in your stance such as, forward tilted head, uneven shoulder height, alignment of knees and increase in spinal curvatures. Once the underlying problem is determined, spinal adjustments, exercises and stretches may be part of the recommended treatment. Our chiropractors also work to educate each patient on the proper way to stand, sit and even sleep in order to help achieve a more proper posture. The importance of having good posture is to keep you spine in proper alignment. By doing this, a person will have less back pains and will have a better physical appearance. Remember, it’s never too late, or early, to get help from a chiropractor with your posture. Have you noticed you have bad posture? Signs you have bad posture include hunched shoulders, rounded upper back, forward head carriage and arched lower back. Another indicator is back pain! Unsure if your posture is bad or good? Contact Dirks Chiropractic in Greenville, Washington and Williamston to schedule an appointment for a spinal evaluation.